Some pictures say it all. 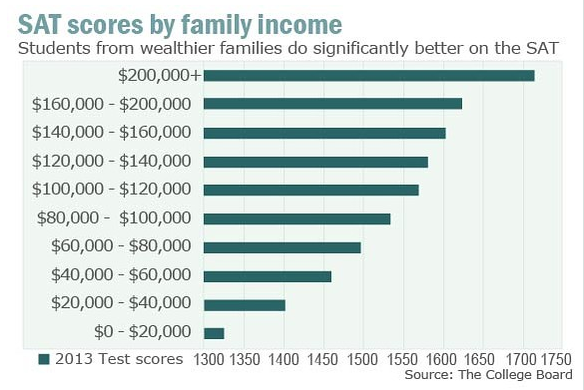 There is no mistaking that the students from higher income families score higher on the SAT. As I've been updating my students' college target lists this summer, I've noticed that SAT scores have increased at many of the colleges since the last reporting of scores. availability and affordability of SAT prep materials. From Kahn Academy offering free SAT tutorials to numerous low priced SAT prep books, motivated students have many options to prepare. Willingness to pay for SAT tutors. Many parents are willing to foot the bill for tutoring and the concept of doing so has become commonplace. an awareness that higher SAT scores may impact admission decisions and access to merit aid. Students who are unhappy with their SAT scores should consider the ACT or look at the hundreds of colleges that are now "test-optional". Every student is different and families need to consider the options that works best for their situation. If you are interested in a more detailed breakdown of demographic info and the SAT, take a look at the Total Group Profile Report for 2013 Colleg-Bound Seniors.